« Startup funding slowdown hits harder in Silicon Valley than S.F. 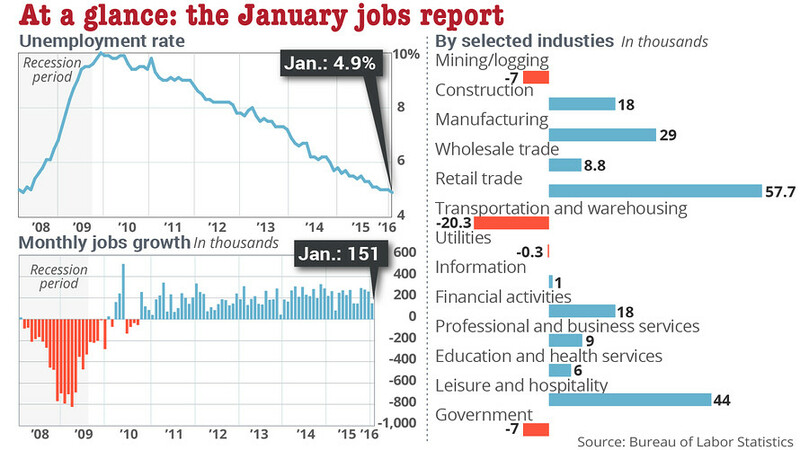 Retail and leisure jobs were the source of January employment growth. WASHINGTON (MarketWatch) — The pace of hiring in the U.S. tapered off in January, but wages rose sharply and the unemployment rate dipped below 5% for the first time since 2008 in a mixed report that adds little clarity about the health of the economy. The U.S. generated 151,000 nonfarm jobs in the first month of 2016, the Labor Department said Friday. Economists polled by MarketWatch had expected hiring to slow to 180,000 after big gains at the end of last year. The smaller-than-expected increase could add to growing worries about a weakening U.S. economy and even the possibility of recession. U.S. stocks fell in early Friday trading. Yet the January jobs report also offered some good news to suggest the labor market remains healthy enough to keep the economy moving. The unemployment rate, for example, fell a tick to 4.9% the lowest reading in eight years. The U.S. is still creating more than enough jobs to keep up with increases in the size of the labor force. Over the past three months, for example, the economy has gained an average of 231,000 new jobs. That’s well above average. In another sign of a robust labor market, the average wage paid to workers jumped 0.5% in January to $25.39 an hour. Wage growth accelerated toward the end of 2015, and it’s climbed 2.5% in the past 12 months, just a hair below the post-recession high set in December. Economists predict wages will rise even faster in 2016 as it gets harder for companies to find good help. At the same time, they expect hiring to slow as the pool of available labor shrinks. In any case, the latest snapshot of labor-market trends did little to clear up questions about where the economy is going. A raft of reports in early 2016 suggests growth remains sluggish following a slowdown in the fourth quarter. “The January employment report is clearly a half glass of water,” said Steve Blitz, chief economist of ITG Investment Research. The mixed picture won’t give the Federal Reserve much to chew over, either. Economists predict the central bank will wait until at least early summer before raising interest rates again. The retail industry added the most new jobs in January, taking on 58,000 new employees. Restaurants hired 47,000 workers and health-care companies boosted payrolls by 37,000. In a surprise, manufacturers also created the most new jobs in a year, with payrolls rising by 29,000. Makers of food products led the way. Yet the increase in hiring in January is unlikely to be sustained as manufacturers struggle with falling exports in key overseas markets. The financial industry beefed up staff by 18,000, continuing a steady trend of hiring after years of little employment growth. Yet the ranks of professionals only increased by 9,000, largely because of a big drop in temps. These types of jobs have grown the rapidly during the economic recovery. As expected, the transportation sector cut 20,000 jobs, mostly couriers used during the holidays to deliver packages. The energy industry, coping with cheap oil, also eliminated more jobs. The pace of job creation at the end of 2015 was little changed after the government incorporated annual revisions in the employment report. Some 262,000 new jobs were created in December instead of 292,000. But November’s gain was raised to 280,000 from 252,000.